I can remember watching Ghostbusters (not the first time, probably the tenth) when I was seven, and afterwards taking an old backpack, a paper towel cardboard tube, and attaching the two with a long piece of a yarn. A shoebox with another piece of yarn attached served as my “ghost trap”. I was always doing these things as a kid. Not having the latest action figures of my favorite comic book or Saturday morning cartoon characters, I would draw and cut out figurines on paper to play with. My desire to tell stories was stronger than the limitations of economy. This is the same love of stories, and being forced to go low tech that informs Garth Jennings’ Son of Rambow. Living in the 1980s, young Wil Proudfoot is the son of a woman involved in a Mennonite-like religious sect. As a result, he is not allowed to view films or television, but has a strong sense of creativity, drawing intricate worlds on the pages of his Bible. Lee is the son of an absent mother, growing up in a nursing home owned by his step-dad, and has an older brother who forces Lee to bootleg movies for him to sell on the street. Lee and Wil meet each other during an incident at school and Wil follows Lee home and glimpses his first film ever: First Blood (the first Rambo film). Wil is smitten with the film and immediately sets about storyboarding his own sequel, Son of Rambow, which he and Lee decide to film together. Jennings is a well known music video director (he’s worked with Blur and Radiohead) and is best known in film for his adaptation of The Hitchhiker’s Guide to the Galaxy. 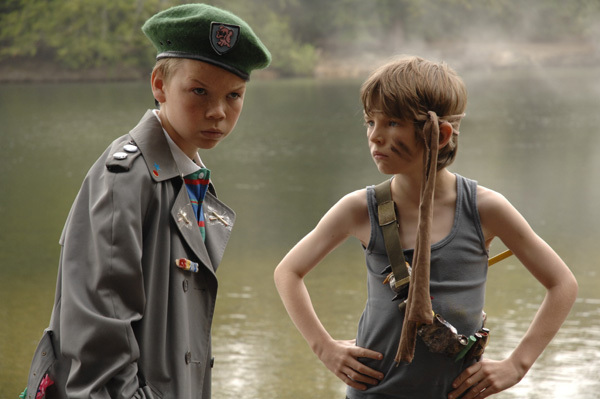 That less-than-stellar flick bears some similarities in its quality to Son of Rambow. Rambow starts out with a crackling sense of excitement and possibility. Wil’s fantasy sequence right after seeing the film is brilliance; done in line drawings on paper and with the slashing speed lines that accompanies such artwork. There’s some great meta-textual commentary on filmmaking as well. As more kids find out about the production, and particularity with the involvement of hip French exchange student, Lee’s vision as director is co-oped. A brilliant scene where Wil is admitted into the upper upperclassmen’s lounge, which parodies the sort of upscaled celeb parties one would encounter in Hollywood (Coke and pop rocks are used to substitute alcohol and cocaine). The flick is definitely worth a view, but wans near the end as it tries to make a “lesson” of the story. I would have enjoyed the sense of playfulness at the beginning to continue throughout. It was also wonderful to see Jessica Hynes, best known for co-starring with Simon Pegg in Spaced. If you get the chance, and were a kid who loved to imagine, check this one out. I know what you are thinking, “Why? Why would you watch this?” My excuse is that the screenplay was worked on by Tina Fey, who also plays the main character’s Math teacher, and I gave it a chance based on her pedigree. Well Tina, you didn’t completely disappoint me. Cady Heron (Lohan) was raised by her parents in Africa, and subsequently homeschooled because of the experience. Now back in the States, Cady is going to a public school for the first time and completely unaware of the highly structured clique system in place. 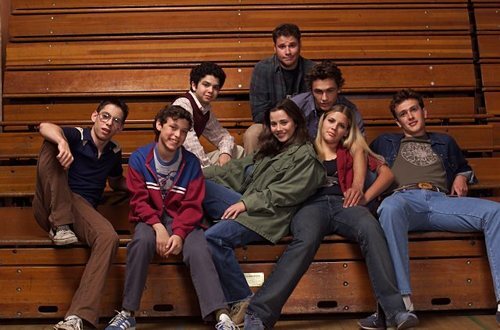 She befriends two of the art kids, Janis and Damian, who encourage her to infiltrate the Plastics (read: popular girls) and ruin the status of queen bee Regina (McAdams). The rest of the film plays out as a mix of typical high school comedy with moments that rise slightly above that. The female cast was definitely a strong one. Every single one of the key actresses has done a lot of notable work before and since this film. I don’t think I had actually ever seen a Lindsay Lohan film (save A Prairie Home Companion where she played a very small role), but she is (was?) a very good actress. Her performance as Cady feels very genuine and I never saw the acting going on, which happens a lot with younger actors and actresses. For example, Lacy Chabert was very transparently acting and it showed. Rachel McAdams was also very good, especially knowing her from other such different roles. But the stand out, and you had to be watching closely to catch it, was Amanda Seyfried. Her role appears simple: the ditz, but the girl has some great comic timing. Pair that with her recent role in Jennifer’s Body, and I am excited about seeing her in upcoming films (particularly the soon to be released Atom Egoyan picture Chloe). As good as these actresses were, it didn’t save the film. The parts I laughed the hardest at were the moments centered around the teachers. Tina Fey, Tim Meadows, and the rest of the cast in those teacher roles were awesome, and I found myself wishing the movie was about the faculty. We have so many teen comedies on the market, but a clever flick, scripted by Fey, about high school teachers would be a treat. 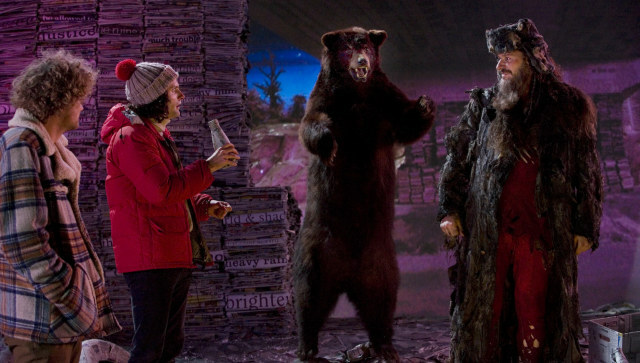 The film will definitely make you laugh, but its nothing worth more than a single view. And I couldn’t help but wonder that instead of using director Mark Waters (Freaky Friday, Just Like Heaven) they had hired JOHN Waters to helm the picture. Now that would have been a skewering of high school hierarchies. John Sayles is not shy about his politics, and this film is definitely the work of a bleeding heart liberal. I myself am a fellow bleeding heart so I sympathize with the sentiments of the picture. However, it is a piece of cinema made out of anger and frustration and, while those elements have helped make great art, they cause Silver City to feel overly bitter and despondent, and way too didactic. The movie opens on the filming a campaign commercial for gubernatorial hopeful Dickie Pilager (Cooper), the dim-witted son of a former governor of Colorado now believing he can win the seat. Sound familiar? Cooper’s performance, obviously modeled on President George W. Bush was very well done and, as much as I like Josh Brolin, made me wish we could have seen Cooper in Oliver Stone’s W. During the filming of this commercial, as Pilager casts a rod into the crystalline lake in the frame, he pulls up a hand belonging to a body left in the water. Immediately, Pilager’s campaign manager (Dreyfus) thinks someone is setting Pilager up and hires a detective agency to investigate. The investigator is Danny O’Brien (Huston), a former news reporter who is less than enthusiastic at first. As he journeys deeper he becomes obsessed with Pilager’s connection to a multi-corporate mogul Wes Benteen (Kristoffersen). On paper, this sounds like a great concept. But it fails, and it fails badly. Huston is completely unnatural in the leading role, proving to me he needs to keep to the supporting ones. I can’t figure out if it was the dialogue or actor, but he comes incredibly stiff and forced in his performance. And with Danny O’Brien as the character we are following, it makes the film that much more painful to get through. Cooper and Dreyfus deliver great performances, but aren’t in enough of the movie to make it work. 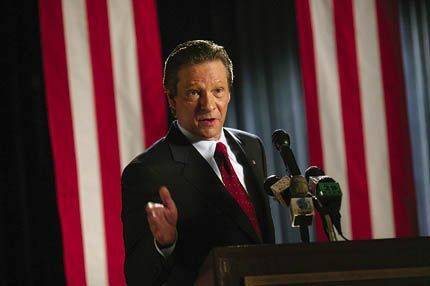 I would have preferred that it had focused on the Pilager character’s campaign more and been a satire of President Bush. Instead, we get a poorly made activist film where metaphors are incredibly shallow. The film made me feel very conflicted, as every political note it touches I am right there in support of. But it proves that when views are expressed too overtly they bog a film down. The film takes it self too seriously for the majority of the time, and when it does attempt to go light, such as when Daryl Hannah’s tough hippie character is introduced, the humor feels hollow and tainted by Sayles bitterness. Not the best work of this director; he CAN make great films about his political views (Matewan for example). Next up: Sunshine State and my final thoughts on John Sayles. This can be marked as the beginning of the Apatow movement in contemporary comedy. 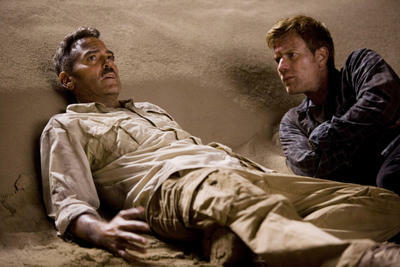 The series was broadcast by a less than enthused NBC, who seemed to go out of their way to air episodes out of order and move the series around the schedule without letting viewers know. The series gained a following when it was reran on Fox Family and then when it was released on DVD in the last few years. The premise follows the Weir sibling, Lindsay (the Freak) and Sam (the Geek) as they go through a year of changes in 1980. Lindsay, a straight-A student and member of the Math-letes, starts hanging out with a group of classic rock loving stoners, and Sam deals with his desire to lose his childish geek image and win the heart of his long time crush. Unlike other nostalgia based programming, there is no maudlin sentiment here. The emotions and resolutions to stories feel honest and real. Characters have parents who are incredibly flawed, and those flaws don’t go away at the end of the episode. One episode in particular deals with a cheating parent, the episode ends on a very ambiguous note. If you haven’t discovered this gem, I highly recommend you hunt it down. If you enjoyed Seinfeld, then Curb Your Enthusiasm will blow your mind. The neurotic basis of George Costanza, Larry David, has created a series in which he plays himself as a buffoon constantly getting into awkward situations based on the misunderstanding of other or, more often than not, David’s own hang ups about minutiae. The series is one of the few to really capture improv comedy working right. 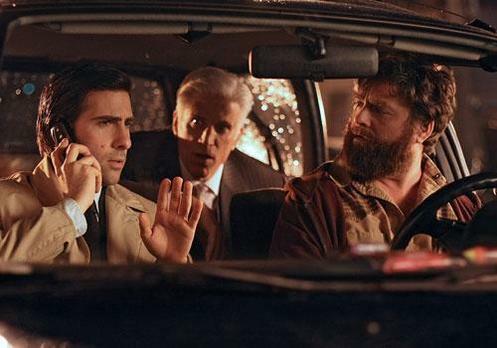 A lot of comedies have followed since and don’t seem to have actors of the high level working in them that Curb does. 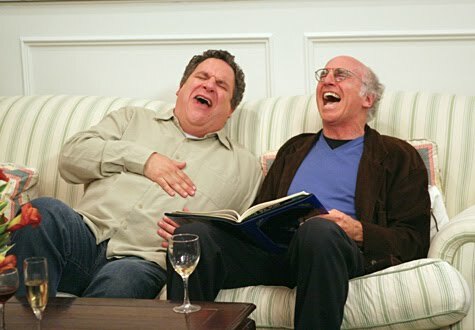 A typical episode of Curb might involve Larry getting into an argument with a wheelchair bound man about using the handicapped toilet stall, followed by him inadvertently insulting a lesbian receptionist about she and her partner’s desire to adopt a Chinese baby. The jokes are never played as mocking these people, but rather comes from David’s desire to see all characters, regardless of their specificities, shown as jerks. He sees that people are more or less jerks when it comes down to it, and how he plays this out is hilarious. 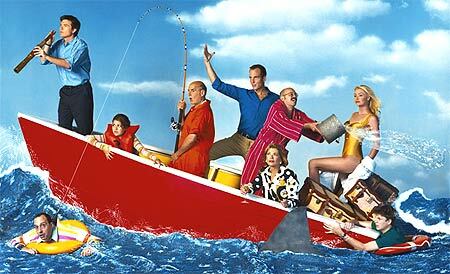 There has never been a more complex, layered, and enjoyable comedy on network television than Arrested Development. From the moment it debuted, Fox seemed to have little interest in it, while viewers and critics loved the hell out of this show. The premise is that George Bluth, owner of the Bluth Corporation is arrested for violating trading laws and his son, Michael finds he’s now in charge of the company and the self-absorbed and moronic family around him. Every actor is bringing their A game here, and the casting is spot on. There are no other actors who could play this character so over the top and still be endearing. The series also incorporates a large number of cameos and employs many of the players from HBO’s Mr. Show (Cross was one of the creators of that skit comedy series). Since the cancellation of series, network television comedy has never seemed as promising to me. A featuring film continuing the adventures of the Bluth family is in the works and set to be released next year, here’s hoping it can live up to the series. This HBO series is a sort of comedic version of Paul Auster’s City of Glass novel. Schwartzman playing a writer named Jonathan Ames (meta, eh? ), loses his girlfriend and out of boredom posts a craiglist ad as an unlicensed private eye. He begins to get cases and finds himself getting caught up in the fun of it. He typically incorporates his indie comic book artist friend (Galifiankis) and pot smoking boss (Danson) on the cases as well. The series has a much more muted sense of comedy than Eastbound and Down, one of the best aspects of HBO’s comedy programming. They do a very good job of balancing multiple styles, yet never lose their quality. The old money and the nouveau riche come together when Dino Correlli and Margaret “Muffin” Brenner get married. And while the film may be called A Wedding, the majority of its two hours take place in the reception. Of all Altman’s comedies, I don’t think I ever laughed as harder than I laughed at this picture. All of his stylistic flourishes are there (zoom ins, overlapping dialogue, language play) yet they are delivered with such madcap humor. I kept thinking of classic 1930s farces as the confusion and misunderstandings increased during the film. And it’s a amazing that with 48 characters I never felt like anyone was ignored. Every personality is apparent and you feel like you are sitting in on a real reception where the groom and bride’s families are hiding some major dislike. The Correllis are a mix of an Italian businessman, Luigi, who married into a rich Floridian family of all daughters. He is made caretaker of the estate by his mother in law, Nettie on the condition that none of his family, whom are in with the mafia, are allowed to step foot in the house. The Brenners are from trucking money, Liam “Snooks” Brenner (Dooley) having made a fortune on coast to coast trucking. From the get-go there are numerous cultural clashes involving wealth, ethnicity, and class. It’s also apparent that there has been some illicit trysts going on between the maid of honor, Buffy Brenner (Farrow) and the groom as well as many other guests at the reception. The best parts of the film are where information in exchanged but with the context completely misinterpreted. Early on in the film Nettie passes away and her other son in law, Dr. Jules decides to keep it secret so as not to ruin the festivities. Of course the information leaks and dozens of family members relay it a real life version of the Telephone game. The wedding planner (Chaplin) runs the show with an iron fist, making sure both staff and guests follow strict and traditional wedding protocol, assigning ludicrous acronyms (Father of the Bride becomes FoB, Mother of the Groom is MoG) to be more efficient. Snooks Brenner is uncomfortably close to his daughter Buffy and ignores his wife, Tulip (Burnett) so that he can spend more time with his pride and joy. The best moment comes when Tulip is seduced by Corelli family member, Mac, who convinces her to join him in an excursion to the family’s greenhouse. This is interrupted by the arrival of the half-dozen children of Burnett’s born again brother-in-law. The film is never completely a comedy, none of Altman’s movies are ever one genre, but it is apparent that there was much silly joy in making this film. Altman developed a system of wireless microphones that allowed him to not interrupt large scenes, but rather pull volume up and down on the conversations he wished to focus on. It’s this genius move that makes it so the director never interrupts the flow of productive acting and works with Altman’s naturalist intent for his films during this period. I would say that even if you have passed Altman over as a director you might enjoy, this is one of his few films that I believe could appeal to a larger audience.